Having watered every single day, first thing in the morning, for almost two weeks, with the responsibility to keep a botanical collection in good nick, has really changed my perspective on what I have never considered one of my favourite activities: I would do a raindance any time rather than have to water! Anyway, even on the plot, I notice the difference. I really pay attention that plants have a good soak, because it is incredible how much water it might take for a pot to get soaked through, and for water to seep down beyond the soil surface. It was strikingly clear when potting on, look at the three samples below: I thought I had soaked all of them through, but only one was, while in the other two most of the compost was dry. Air pots do not help in that respect, as water easily pours out of a hole, at the end of a cone, if it finds a way through. On the other hand, they cannot really get waterlogged. Considering that, I am now checking that all lighter pots are not dry at the bottom, and if they are, I keep pouring water until I can see it running out of the bottom with my own eyes. In the case of some compacted, or particularly dry pots, it might mean passing over the plant five or six times. At the plot, I noticed the same: I was watering with a hose, which I had left on the same spot quite some time, but when I scratched the surface, water had not really seeped past the first few millimeters. As I could not remember all the details of how water moves through the soil, and what factors affect that, and was really keen to understand more, I did a bit of research. Infiltration is the entry of water through the soil surface. 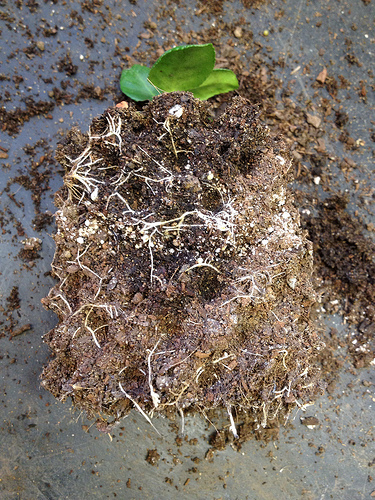 It depends on several factors, including soil texture and porosity (cracks and pores allow water into the soil more easily while compaction prevents water from seeping through), which in turn depends on soil composition (sandy soil have generally bigger pores, clay soil expand and contract with the level of humidity, organic matter favours absorpion of water), on previous soil moisture content (wet soil absorb less than dry ones), whether the impact of the drop of water is sealing any pores (soil capping; the presence of vegetation, for example, usually prevents that, that is why you should not leave soil bare in winter), whether there are any hydrophobic substances on the soil surface (such as some oils from chaparral leaves). A presentation on the University of Wisconsin's website finally cleared my doubts about how infiltration happens. Infiltration depends on the balance between cohesive and adhesive forces. Water drops stick together because of cohesive forces among their particles that create what is known as the water surface tension. The angle with which a water drop touches the soil may or may not cause adhesive forces, and the composition of the soil happens to alter such angle, and that is how some soils' "wettability" is higher than others. Once inside the soil, water moves both vertically and laterally through gravity and capillary action. 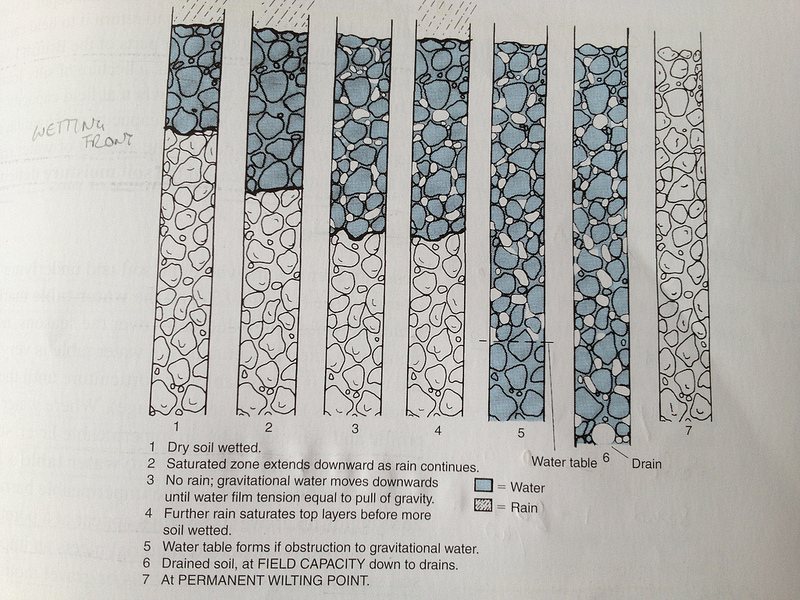 Movement through gravity is called percolation and the wetting front's route is through soil pores (that are big enough) and until it reaches the water table (if there is enough water, otherwise the flow stops when the pull of gravity equals the film tension), saturating a zone before moving on to the next. Field capacity is the state of a soil that has been wetted through, after gravitational drainage has taken place and macropores (>0.05 mm) contain air instead of water again. The amount of water in such soil is its water holding capacity (WHC, measured in mm water/depth of soil). The ideal soil for most plants has a 10-15% air-filled porosity or air capacity, so basically that percentage of macropores. 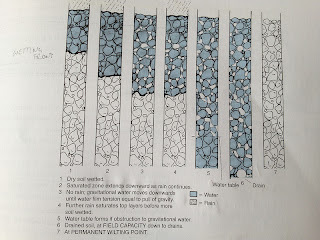 Capillary movement is both vertical (up from the water table, or up from wet soil to dry soil because of evaporation*, and down from wet soils) and lateral, and it caused by the cohesion forces inside water. It takes place in micropores (< 0.05 mm). Plants' roots can only grow into pores that are > 0.02 mm (and anyway if a pore was < 0.01 mm the adhesion forces on the soil particles' walls would hold the water film so strongly that it is not accessible to root). 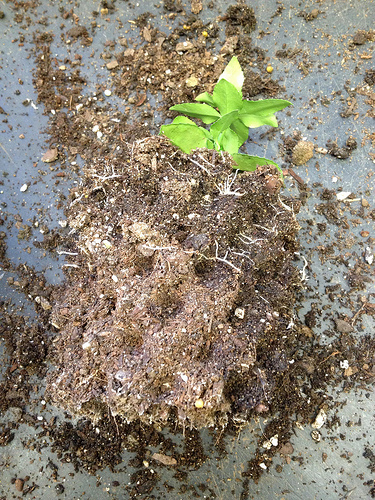 Permanent wilting point is the state of a soil that does not make any more water available to plants, so that they remain wilted after the night (while wilting during the day because of transpiration, at night they would usually recover, that is until PWP is reached), and until they get watered. *a dry layer of soil (20 mm) helps conserve moisture underneath, acting as a buffer by interrupting the suction forces exercised by water films and their internal cohesion: a reason not to water little and often, but soaking through! 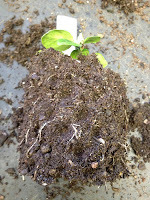 Also, a life canopy shading the soil surface prevents drying out, again: do not leave soil bare. Availability of water to roots is restricted by high salt concentrations in it: osmosis works from low salt to high salt, so if the salt levels are higher in the soil, osmosis is actually reversed, water flows out of the roots, cells lose water and may die (plasmolysis). A good reason not to apply too much fertiliser. 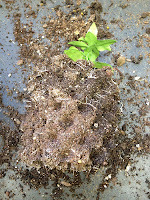 c. soil aggregation and water holding capacity once transformed into humus by soil micro-organisms. Humus is a colloidal material that coats soil particles, giving topsoil (where micro-organisms are active) its darker colour. It acts as a sponge and can absorb up to 7 times its volume in water. The "My agriculture information bank" website has rather clear basic explanations of these concepts and I found it useful as a starting point in my research.